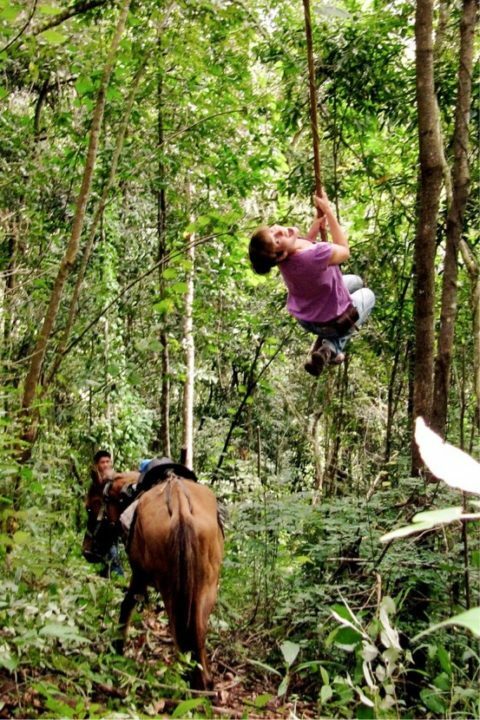 Thai Horse Farm – Experience Northern-Thailands Jungles on Horseback! Get away from the hustle and bustle of Chiang Mai by exploring the jungles of northern Thailand. 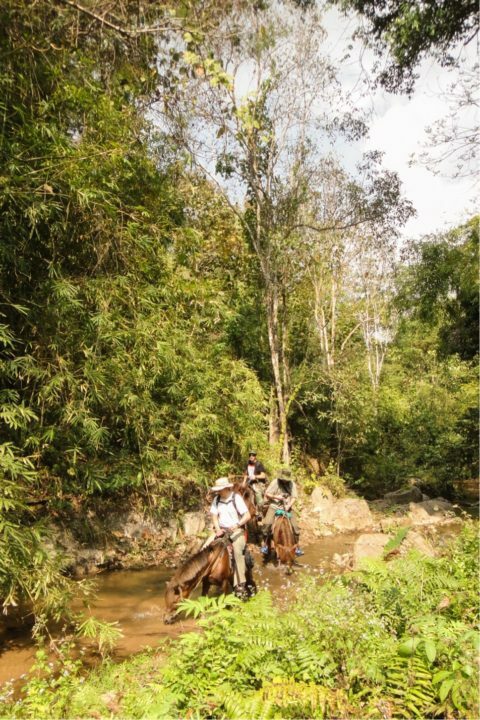 Travel on horseback through the picturesque and magical world of the mountain and jungle region in the Golden Triangle. Our exclusive small-group tour (up to 4 people) can be booked here. We will pick you up at 8 a.m. from the “Three Kings Monument” in Chiang Mai. After a 45 minute drive we will reach our farm, located on the foothills of the Doi Thaen mountains. When we arrive at the farm, we will welcome you with a proper breakfast including homemade bread. Small trails and mountain passes will lead us to the most remote wild areas. These trails were originally used by trading Muang, Chinese and nomadic tribes. Around noon we will reach a stream running from the mountains – our stop for a break. A culinary journey into the past awaits you. We have a special jungle meal planned for you! Before the age of iron and steel people here cooked inside hollow bamboo instead of pots and pans. It is a real treat to see and taste this style of cooking in a natural setting. For vegetarians and vegans we can prepare special meals. We also offer lactose-free options. Make sure to let us know about your preferences upon booking. After lunch we continue traveling through nature’s breathtaking beauty. As we pass through the jungle, we will see typical jungle plants and trees. You can spot teak trees, monkey wood trees, gigantic acacias as well as tall strangler figs. Marks and tracks of the small asian wild boar are abundant in this region. With some luck we’ll get to see one. With some more luck we might even spot a family of monkeys in the trees – there are still some living in these forests. 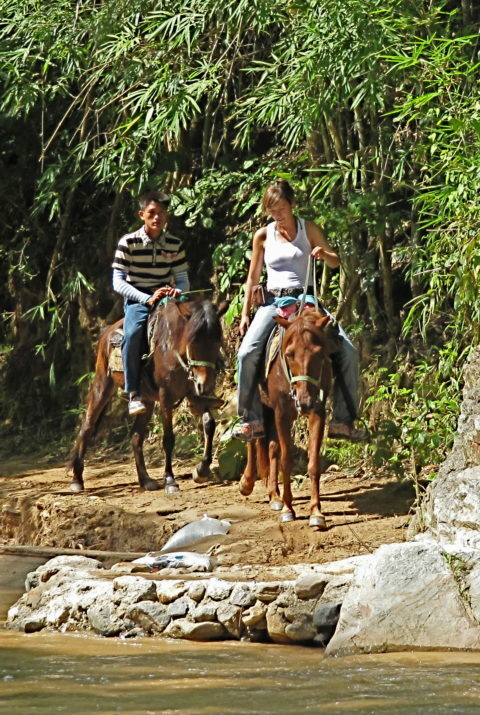 Only a few spots on the narrow trails, leading through the dense jungle, are suitable for trot or gallop. The captivating landscape is best savored at a slower pace anyway! After arriving at our farm, we will bring you back to Chiang Mai, right on time for dinner. We will leave the evening to you, to reminisce about all the amazing things you experienced today. Here you’ll find the answers. Is the tour suitable for non-riders? Yes! Our well-tempered horses have a good nature and a special character, therefore our tours are suitable for non-riders as well. 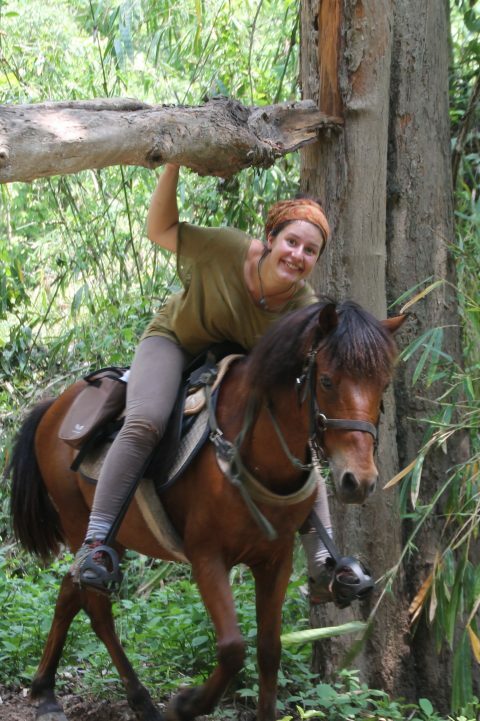 Actually most of our guests have never ridden a horse before. Are there vegetarian and vegan options? Yes, absolutely!. We have experience in preparing not just any vegetarian/vegan but delicious vegetarian/vegan food. 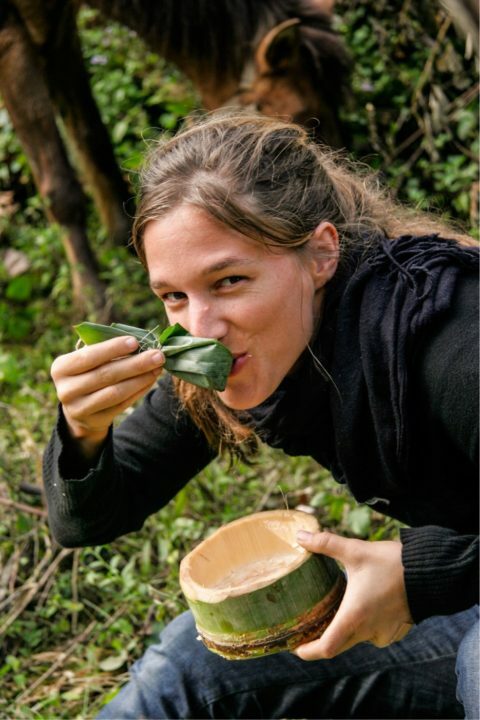 For example tofu baked in banana leaves served with fresh jungle herbs. 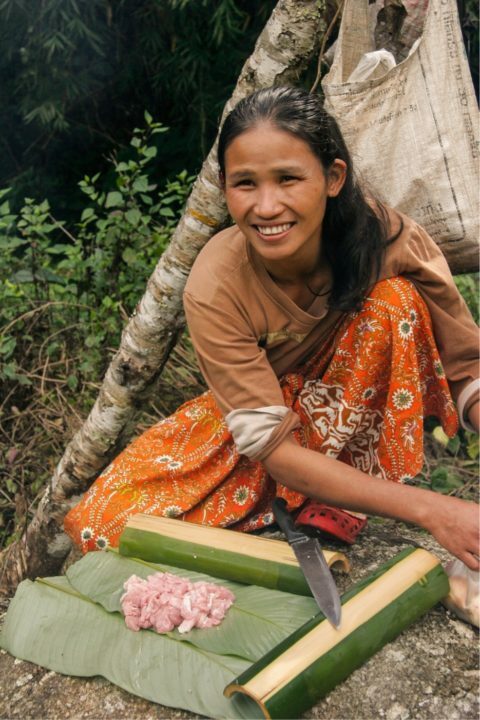 Or a meal made from banana-blossoms according to the culinary traditions of the Lahu. Just make sure that you specify your food preferences in the appropriate field in the booking form (second booking step). Besides vegetarian and vegan we also offer lactose-free food. Yes, there is. Unfortunately our horses are unable to carry more than 90 kg / 200 lbs. However, you are always welcome to join us on foot! My partner does not want to ride. Is it possible to join the tour by foot? No problem, your partner is more than welcome to join the tour on foot. Added bonus: they can take great pictures of you! How can I book the One-Day adventure now? Choose your desired day and select the number of participants on our booking page. Please specify in the booking form, if you want a vegetarian, vegan or lactose-free meal. Once you finish the booking you will receive a confirmation e-mail. The payment is due on the day of the tour. We don’t accept credit cards so please make sure to bring cash. 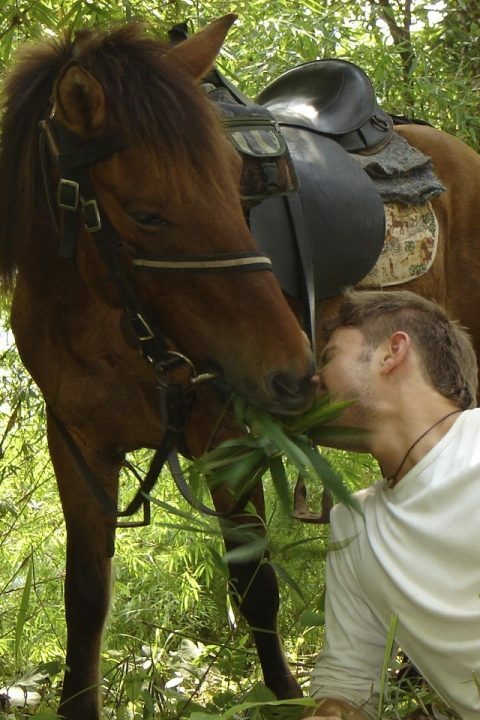 We are southeast asia’s largest vendor of horseback riding tours. For nearly 20 years now, we have been engaged in protecting the natural environment by eco-tourism. Our family business combines German management with Thai hospitality. See our main website for for more detailed information about us and northern Thailand! We hope to welcome you soon at the Thai Horse Farm!